We provide our customers with pleasant and professional cleaners who are in uniform and care about the quality of their work. From the underground parking lot to the top floor, our staff will assure that the job is done right each and every day. Our qualified managers will work with the customer to establish a package that would best suit their needs. Aragon Building Maintenance also provides services other than the regular maintenance of the building. Some of these additional services include our relief superintendent program and a twenty-four hour emergency flood service. Our management team is also available to our customers at all times to address any concerns or questions regarding our services, or any other inquiries we can assist them with. 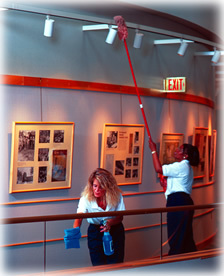 The lead hand in charge covers the day-to-day supervision and control over the cleaning staff on site. We also provide Area supervisor visits as often as necessary or a minimum of twice per week to inspect all the building areas together with the lead hand. A Management representative or Quality Control Inspector will visit and inspect the building once per month to discuss service quality and recommendations regarding special services. Our main objective is to keep the appearance of the building in top condition.